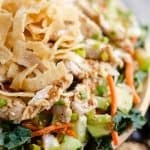 Toasted Sesame Asian Chicken Salad is a healthy dinner salad recipe full of fresh vegetables, crispy wonton strips and topped with a light homemade dressing. I am a sucker for a good chicken and fruit lettuce salad. From a fall favorite Harvest Chicken & Apple Salad, to a fresh summer Strawberry & Coconut Cashew Salad, I adore the combination of sweet and savory. Sometimes it is nice to really change up the flavors of your go-to salads though and this Asian Toasted Sesame Chicken Salad really does the trick. It’s a departure from the salad I typically enjoy, but it is oh so good! 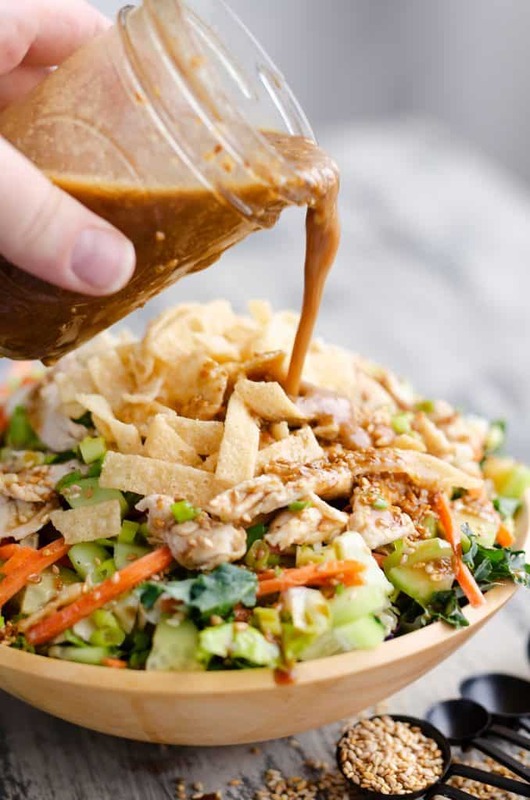 The combination of crunchy cucumbers, carrots and wontons paired with the shredded chicken dressed in a bold homemade Toasted Sesame Asian Salad Dressing is a healthy and filling dinner salad I love. 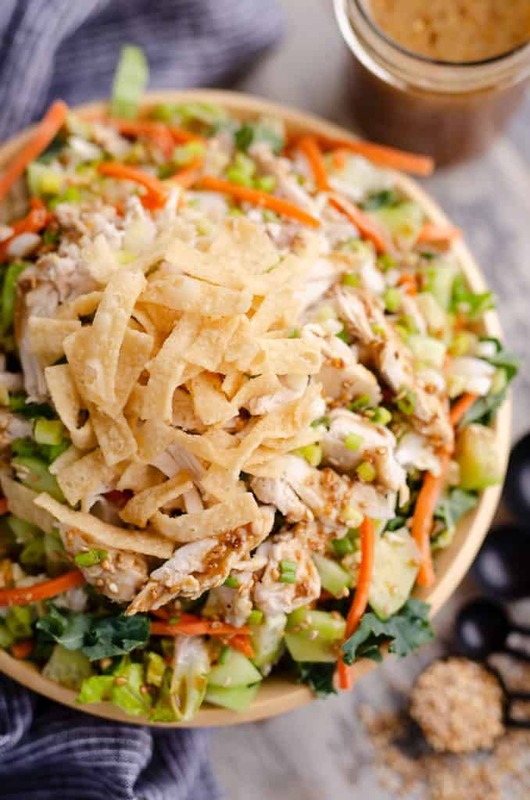 The beauty of salads like this Toasted Sesame Asian Chicken Salad, is that it comes together quickly with a few simple ingredients tossed together in an easy and healthy salad. From pre-cooked rotisserie chicken that I buy already prepared and cubed at the grocery store to a bag of mixed lettuce and cabbage and a couple simple vegetables, there is nothing too complex about this recipe. I am all about homemade salad dressings, but you could certainly finish this off with a store bought vinaigrette if you are short on time. You can toss this entire salad together in less time than it would take you to run to Panera to grab an Asian Sesame Chicken Salad! I love all the toasted sesame seeds in this salads. 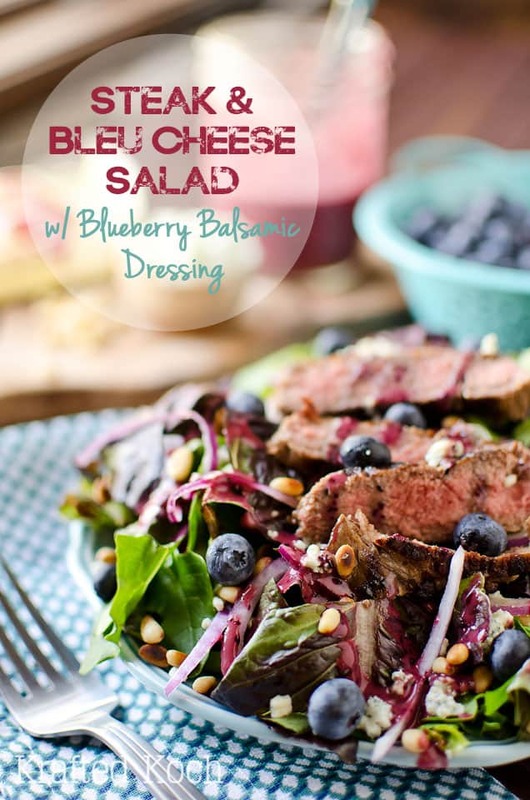 Not only do they provide a nutty crunch in the salad dressing and sprinkled on top of the salad, they have lots of healthy and beauty benefits as well. They are rich in minerals like magnesium and calcium as well as being high protein. 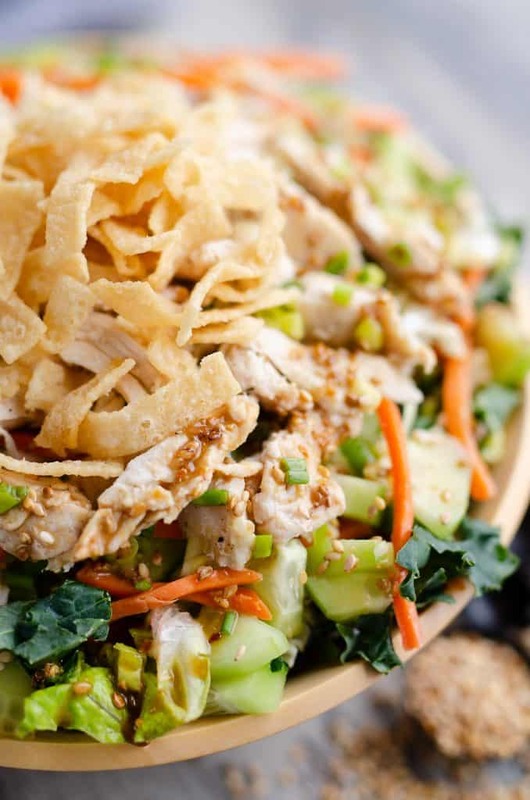 They are believed to be good for your hair and skin healthy which is an added bonus to enjoying this delicious Toasted Sesame Asian Chicken Salad! Once you toast your sesame seeds and assemble the remaining ingredients it is time to assemble this easy salad. You can certainly chop up some fresh cabbage and romaine lettuce yourself, but I prefer to take the easy route and buy the pre-packed bags at the grocery store. Add your greens, chicken and vegetables into a large bowl and toss with the homemade salad dressing. I like to use a bowl with a lid so I can just seal it up and shake the heck out of it. 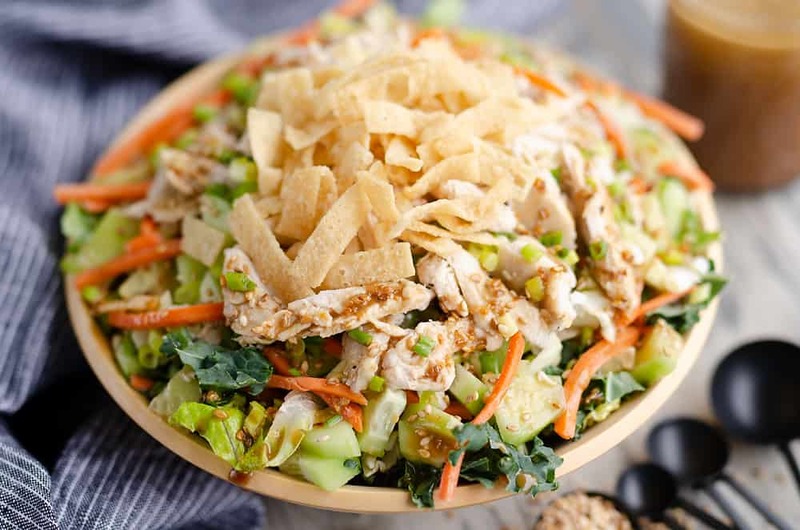 After all of your veggies and chicken are evenly coated in the salad dressing, top the salad with the crispy wonton strips and a sprinkle of additional toasted sesame seeds. 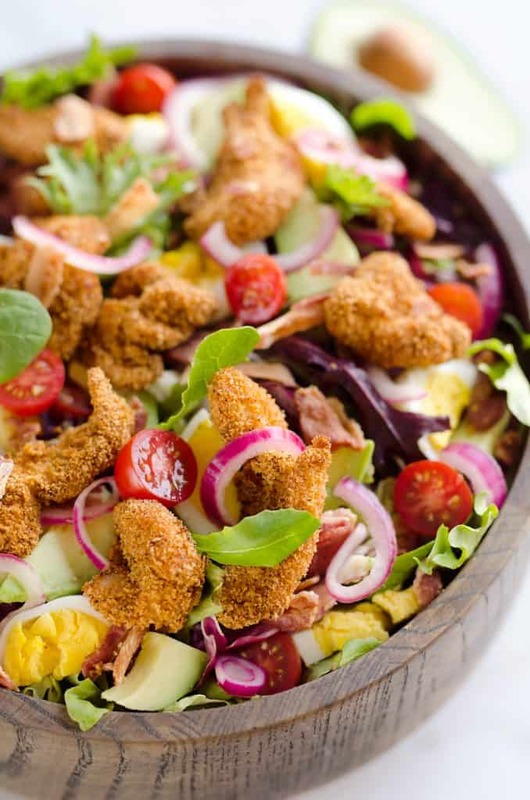 In less than 10 minutes you have a healthy and hearty salad ready to enjoy! If your children are anything like mine and want to eat whatever you have, they will enjoy the salad as well. My kids will not eat a cucumber to save their lives if I put it on their high chairs, but man alive they gobbled them right up when they were coming right from Mommy’s salad. Haha! That is the beauty of eating healthy around the kids, it encourages them to try more healthy vegetables and flavors they might not otherwise be open to. 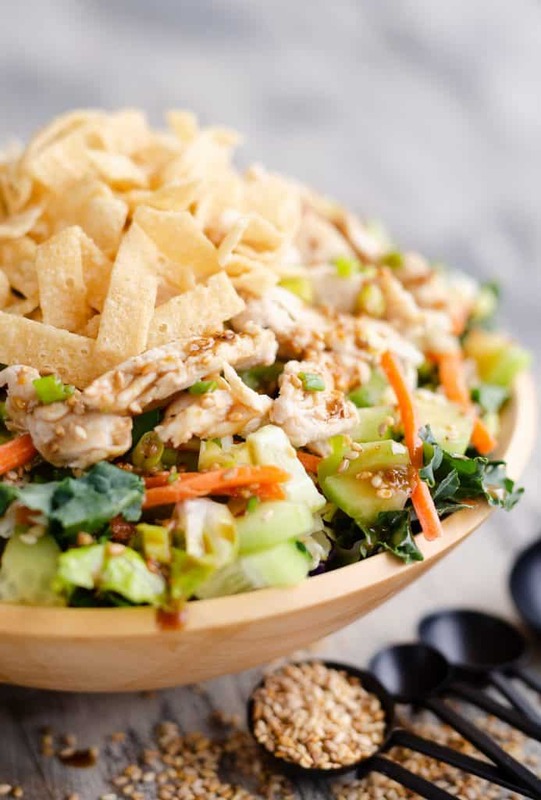 Toasted Sesame Asian Chicken Salad is a healthy dinner salad recipe full of fresh vegetables, crispy wontons and topped with a light homemade dressing. 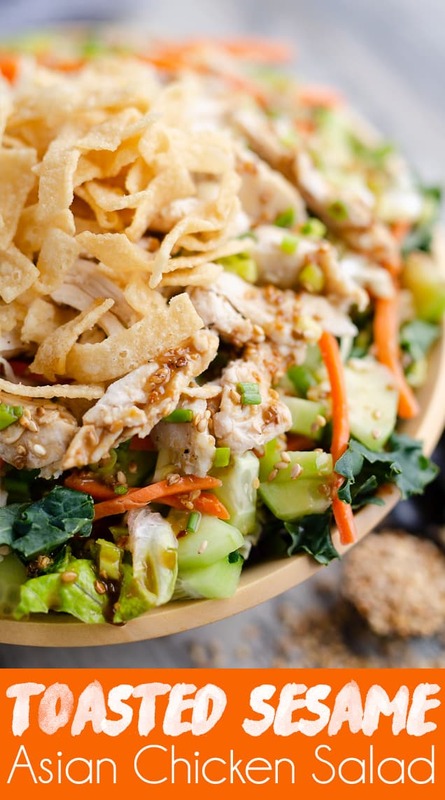 Top the salad with the crispy wonton strips and a sprinkle of additional toasted sesame seeds. Enjoy immediately. I buy the bagged Asian salad kits all the time because I’m so lazy! I know I’m going to LOVE this salad! I always order the Asian salad when out at a restaurant. Now I can make it at home. This looks amazing! Ahh, yes! This is the salad I was looking for! Thank you for sharing! I will only eat salad if it’s made like these, FULL OF FLAVOR! !